Three months have slipped astern quickly. A nautical theme and at last a report. Sue and I had our week's summer holiday in Cyprus. 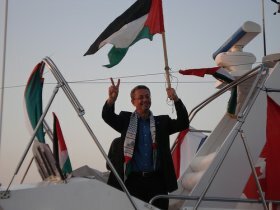 Sue was cooking for forty Free Gaza folk, with some help from me, and I instructed them in safety at sea. www.freegaza.org Before that I spoke to the DVD of 'Eyes Open Gaza' – the record of the voyage of the Dove and the Dolphin almost six years ago. We took a charter flight to Larnaca at the end of July to join the shore party and those waiting to embark on the first Free Gaza voyage to Gaza. This brave venture had been two years in the womb. It was in March 2006 that the siege of Gaza was first laid after a majority of Palestinians voted for the 'wrong' party in the first ever election. Free Gaza was conceived in response to this imprisonment. The purposes were solidarity, to share our common humanity, and to take medical supplies in and a few people out. These would be Palestinians joining loved ones outside the prison, a few of the many students promised university places abroad and some sick people needing specialist treatment. Cyprus was sizzling, both by day and by night. The concrete of the University of Cyprus students' residence did the same. We made good friends. Among the many was Hedy Epstein. She had a little 'turn' so she did not go on the boats to Gaza which broke her heart. She was later to give a talk to a good audience in the Mint Church, Exeter. She told of her childhood in the Black Forest and her journey to Britain in the kindertransport. She kept in touch with her parents until there was silence. Hedy spoke of her four visits to Israel. Her stark descriptions of the treatment of herself and others will be remembered. Progress with the FM radio station – Radio Dolphin has been slow because of the isolation of Gaza. If there were open borders, the station would have been broadcasting by midsummer. The medical supplies were not allowed through Rafah into Gaza. Linda Willis had to fly back for her work in Scotland. It is understood that Khalil Al Niss passed these supplies to the Hashemite charity in Amman, Jordan. It had been agreed that they would be part of a convoy formed to supply hospitals in Gaza. They have not yet been delivered. This is but one of the unsatisfactory parts of this project. It was well conceived and courageous, but like so many endeavours in the human world, it became ragged. I have been planning to go to Gaza on 8 November 2008. I was then going to leave Gaza to join a party of seventeen people – all health workers with nine doctors among them. As a group we were going to examine medical issues in Palestine. At least half the time will be spent learning and teaching with Palestinian doctors, and possibly at one Israeli hospital. I submitted the details of every one on behalf of the charity so that we could enter Gaza and spend three valuable days there. For the time being this has not been approved by the Israeli Defence Force. We hope our human plans will be approved but it will be at the last minute. Good news – the second Free Gaza voyage ended last week in Cyprus. The third happens in three days. Amongst those on board will be thirteen members of the European Parliament and Baroness Tonge. Well done and bon voyage.